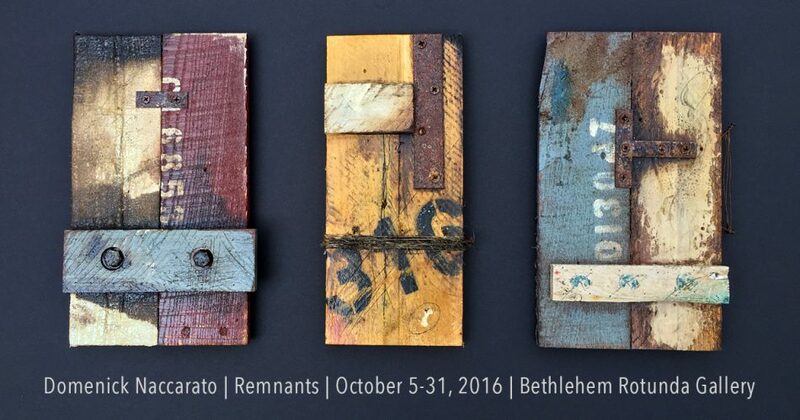 Starting next week, I’ll be exhibiting some of my new work at the Rotunda Gallery in Bethlehem, PA. The Bethlehem Fine Arts Commission hosts a monthly rotation of regional artists and organizations and I’m honored to have been invited to participate. My show runs through October 31st, 2016 with a small reception planned for Sunday, October 9 from 2:00 to 4:00 PM. The Rotunda Gallery is located at 10 E. Church Street. Gallery hours are Monday to Friday from 8:30 AM to 4:30 PM. The pieces in this exhibition are inspired by the nuances of what some might refer to as detritus, or debris… perhaps discarded away from some construction or demolition site, or back alley of a warehouse – only to be seemingly found by the artist and showcased for their beauty. His work explores the idea that what we call art can take many forms, even in these kinds of dirty or unkempt surfaces. Naccarato combines various sculptural elements of assemblage into the pieces, including: wood, hardware, wire, twine, and even nails. He incorporates these with other non-traditional mediums such house paint, joint compound, wood stains, and roofing tar. The various compositions he creates in these small vignettes may appear to be random, but objects, mediums, and typographical elements are in fact thoughtfully placed and planned. Domenick Naccarato received a degree in Fine Art from The College of New Jersey in 1998. Although he has been producing work since then, it has only been within the past three years that he has exhibited on a regular basis, primarily in and around the Lehigh Valley. He sits on the board of the Lehigh Art Alliance and is also a member of the Arts Community of Easton. Naccarato works out of his home studio in Lower Macungie Township and his art can be seen online at www.domenicknaccarato.com.